The Austin Handbell Choir, of Burlington’s First Congregational Church, has been performing for 50 years. You read that right: 50. Since the Beatles came to America. And the group chose to perform for its debut concert not “I Want to Hold Your Hand” but “Away in a Manger.” Go figure. This Sunday, the Austin Handbell Choir will perform a halfcentury after that debut, to the day. One of its earliest continuous members, Louise Brewster, happens to be the president-elect of the First Congregationalist. Sylvia Stebbins, also an early member, has been the bell choir’s director for 19 years. Judith Doerner has been ringing with Austin Handbell for seven years and handles publicity. Retired from the USDA Natural Resources Conservation Service, Doerner plays, too, with the Vermont handbell group Northern Bronze, which has performed with Bella Voce women’s chorus. Clearly a handbell devotee, she graciously attempts to straighten out this reporter on the various kinds of bells and chimes and the ways of ringing and striking them. Tower bell ringers’ enthusiasm for practicing the complicated algorithms of change ringing can easily exceed the neighbours’ patience, so in the days before modern sound control, handbells offered them a way to continue ringing without the aural assault. Five handbell choirs in the Green Mountain State are listed on the Handbell Musicians of America website, none of them the Austin group. (Not everyone belongs to the same national associations, Doerner says.) Adding to the confusion, a choir with the website austinhandbells.org is in Texas. 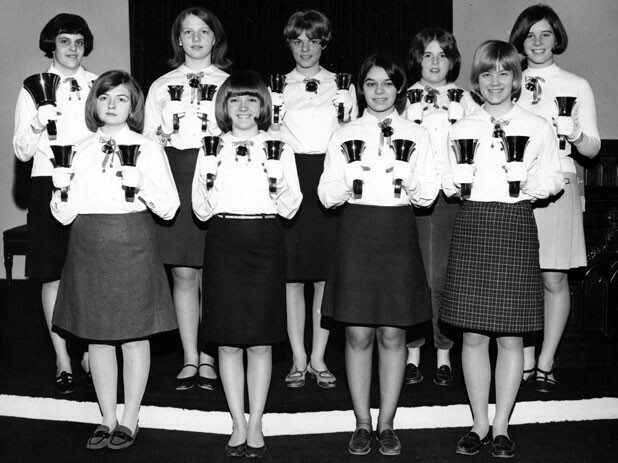 In Burlington, the Austin Handbell Choir gets its name from its original benefactor. Not all handbell choirs are affiliated with churches. Just check out the amazing cover of Adele’s “Rolling in the Deep” by a New Jersey high school handbell choir on YouTube. And an “advanced community handbell choir” in North Carolina called the Raleigh Ringers “are just phenomenal,” advises Doerner. That group’s alter ego: the Rockin’ Raleigh Ringers, hints at their secular taste. “Stairway to Heaven” isn’t on Austin Handbell’s set list this Sunday, but rest assured, the ensemble has far surpassed “Away in a Manger.” It will perform some 15 numbers, says Doerner, from the devotional song “On Eagle’s Wings” to Chopin’s Nocturne in C minor; from “Hava Nagila” to Handel’s Hallelujah Chorus. Doerner herself will solo on a medley of hymns, and “five or six former members of the bell choir will also play,” she says. Way to ring out the year. Austin Handbell Choir 50th Anniversary Concert. Sunday, December 15, 3 p.m. at the First Congregational Church, 38 South Winooski Avenue in Burlington. Free. Info, 862-5010.